Most small businesses have little to no IT support, so I step in an as extension of their team to take the day-to-day management of IT off their plate. Welcome, my name is David. I started ResTech Solutions in 2011 because I enjoy working with technology and helping others. I also wanted to help individuals and businesses with a more personalized level of service to support their technology needs. All services are a concierge style service to ensure all needs are addressed. I believe technology should enrich your everyday life and not be a stumbling block to what you want to accomplish. I like to solve problems and provide solutions. I’ve had many influences in my life that have lead me to this point; Boy Scouts of America – Earning the rank of Eagle Scout; the skills and the values I’ve learned; the people I’ve met; family. Having a business like this has been a goal of mine for many years. Doing this is what I enjoy. Here at ResTech Solutions we utilize several approaches. We simplify each task, use automation, and proactively monitor your sites and systems. We speak business English not “Computereze”. We explain what we see a problem (or opportunity) to be and offer a solution all can understand. A simplified solution is likely to be the most reliable. We often can review a business process and suggest ways to automate it. Our intent will be to join several computer programs (or human tasks) that will run in sequence without human intervention. The results will be data that is refined, summarized and easy to work with. As we work with you we will utilize techniques for proactive monitoring. We want to make sure that that we proactively identify and resolve issues before they become a problem. Why Should You Do Business With US? I am young and energetic, I grew up using and working with computers and I’ll work hard to provide the services that you need. Although I work with technology my business is still a people business. My work today assures your return. I have the expertise to do your job right, the first time. I’ve been working in an environment where all kinds of new things come into the business. I know about the latest technology yet haven’t forgotten about older technology. I will be price competitive. I price my services to give you more value at less cost. I realize that businesses build their reputation based upon performance and I will make sure that you’re pleased with my work. l stand by my word. If I quote a price I will do an outstanding job and at the price quoted. I want your business. Do you have a question? Call me, I’ll answer your question, I’ll share my knowledge for free. 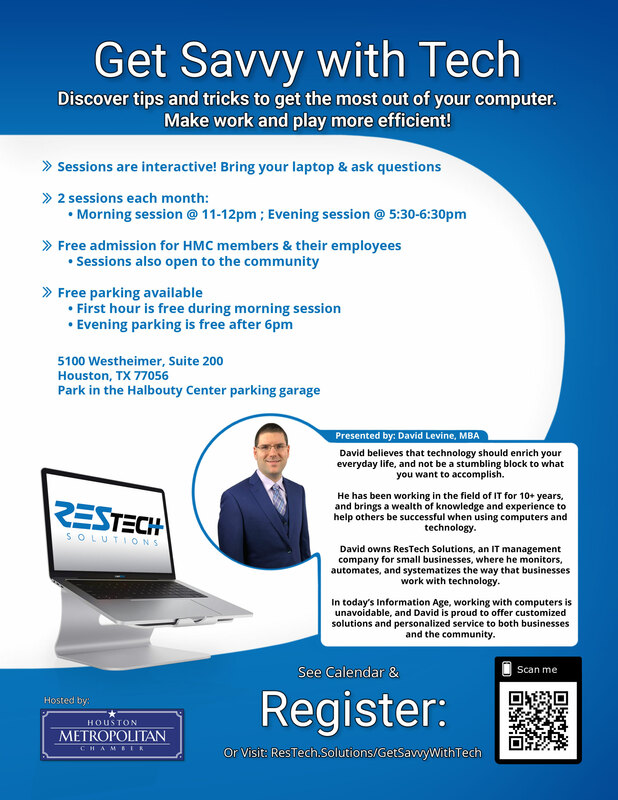 Join our mailing list and stay up to date on the latest happenings at ResTech and receive tips and tricks. If you are looking for general information or have a non-urgent request please visit our contact page. Copyright 2011 - 2019 - ResTech Solutions, LLC all rights reserved.